Translation: Junji Uchida. 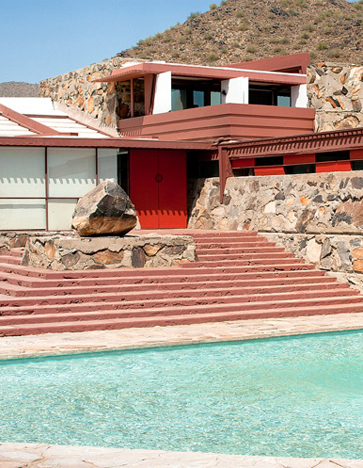 Thereafter in 1937 he began building his personal winter home, studio, and architectural campus: The Taliesin West. This masterpiece is a retro-futuristic construction in the middle of Arizona’s desert, surrounded by winding roads and 7 meters high cactuses. This is pretty much 5 hours dive from L.A via Ten-East freeway throughout the Palm dessert, if you are up for it, or half an hour if you are in Phoenix or Arizona already. This is an area under extreme weather conditions where temperatures might go beyond 50° C in summertime. That gives you a hint about what it means to start off a project of this nature in such scenario at that time. Do not worry thou, at Taliesin West they will take care of you, air conditioner and customized bottles of water for free available for all visitors. This arid area is located on the beautiful Sonoran desert in the foothills of the McDowell Mountains in northeast Scottsdale, Arizona. The Taliesin West experience is like finding out of the blue an alien spaceship in the middle of nowhere. Frank Lloyd Wright said himself, “Oh, we have to build here, this is pure abstraction wherever you look.” I could say “pure inspiration wherever you look.” The entire building is made of basic materials as wood, glass and concrete and it has a system of ceilings made of canvas under the glass, which protects the interior from the heavy sunlight, experiencing Wright’s brilliant ability to integrate indoor and outdoor spaces. It took twenty-two years to build it, until be ready in 1959. The Taliesin West among the terraces and gardens has several spaces including personal living quarters, Wright’s offices, the “Garden Room,” Music Pavilion, theater/conference space, “Dinning Room” and an acoustic space build in the basement aimed for performances. Nothing in these spaces is casual so Wright’s vision is technically crafted to the state of the art, breaking down contemporary standards, even one century afterwards. Wright took care of all furniture design, cubic shapes and hexagonal chairs and tables, all wrapped up together with the architectural concept in one unique vision. There are several options of tours, prices ranging between $24-$40, regarding how deep you would like to go with your architectural enthusiasm. You can check tour schedule for more information. You might also have a look to the book and gifts store. In addition, an ongoing energizing project is taking place at Taliesin West: a pioneering initiative integrating sustainable energy at Taliesin West is underway. The goal of the groundbreaking effort is to transform the entire National Historic Landmark site into a “net zero” energy customer — producing as much energy as it consumes annually — while maintaining the historic and architectural integrity of the site. Opening Hours & Admission: Look for the different tour information.